Tuna & Seaweed is a source of beneficial minerals such as iron, iodine, potassium and trace elements. All flavours are naturally rich in taurine. This ingredient supports the heart and eye function. 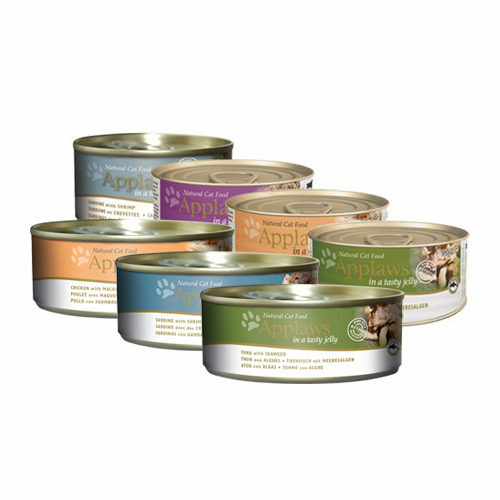 Applaws Cat Food Jelly is available in 24 tins of 70 grams each or in 24 tins of 156 grams. Mackerel & Seabream: Mackerel (56%), seabream (4%) and vegetable gelling agent. Sardine & Shrimp: Sardines (56%), shrimp (4%), vegetable gelling agent. Tuna & Seaweed: Whole tuna (56%), seaweed (4%) and vegetable gelling agent. Have you used Applaws Cat Food - Jelly before? Let us know what you think about this product.